It is the biggest and the strongest, complete the thumb in action taking. It is the finger of the inner life, the inner government of things and also has strong ties to sexuality. It is related to the power over the other, with pleasure and satisfaction to possess the other, with the degree of satisfaction in our sexual experiences. It reflects the most primitive sexuality, the hidden sexual desires. The problems in this finger may indicate dissatisfaction we feel for the way things happen at that level. Perhaps you had a problem of sexual type, either with your partner or, some sexual issue affects you. They may reflect difficulties in taking one's sexuality too because you seek perfection in this area because you feel rejected in privacy or guilt. 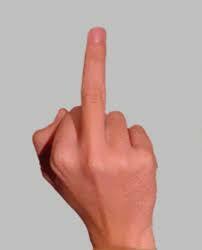 Moreover, this finger usually tells us when we're angry or upset with someone. It is related to the touch.